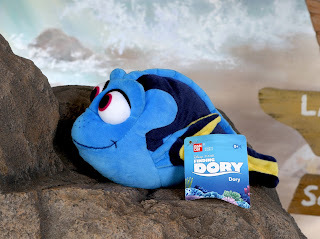 Released this summer from Bandai Toys, here we have their Finding Dory 10" basic Dory plush! Since the Disney Store didn't release a smaller size plush of Dory this year, I was super glad to see this one. I wanted a Dory that was comparable to the size of the Disney Store Jenny and Charlie plush (which I'll be showing here soon), and this one is just that. It goes perfect with them and all the other characters I have! Most importantly, this toy has a nice likeness to the character and feels quality made overall. You can find this plushie at stores like Target, Walmart and Toy R Us (among others I'm sure). Retail price is $12.99. A big thanks to Bandai for sending this over to me! Note: Looking for a bigger Dory? Or maybe one that's a bit smaller? No problem. 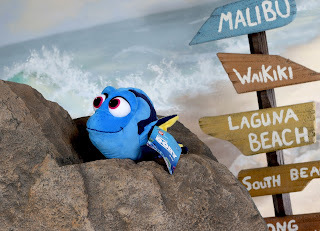 This plush also comes in mini (6"), large (20") and jumbo (26") sizes.